Valentine’s Day is approaching! Looking for the special gift for your Valentine? Here, Winni brings you the most unique gift for you that can easily make your beloved one feel special. This Valentine’s Day Chocolate Platter is a tasteful gift, full of delectable chocolates, speaking your true love for your lady in a sweet manner. This chocolate platter is wrapped in a luxurious, golden foil, so it's a perfect thing to gift your special one. 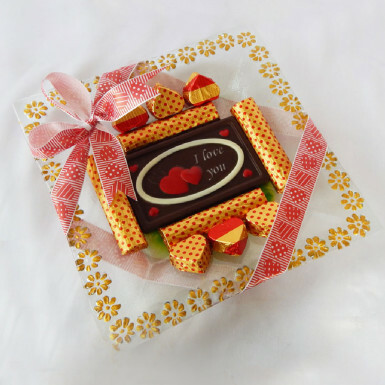 This Valentine’s Day surprise your lover with this exquisite Chocolate platter gifts. So, place your order now!